This well-planned ski chalet uses some of the successful strategies of larger ski lodges on a family scale. Start with covered outdoor storage adjacent to the basement entrance for removing equipment. Inside we find a large storage area, easy access to the laundry room and a three-sided fireplace in the middle of the family room. This level is a great place for the kids to warm and sip chocolate after playing in the snow! The basement also includes two bedrooms and a shower room. There is so much more to this chalet, so up the stairs we go! A good sized master bedroom includes private access to a 5-piece bathroom. The living room, kitchen with island and dining area all enjoy the warmth of another three-sided fireplace and the grand feeling of a 21’ cathedral ceiling. A full-width deck is ideal for drinking in the views. Upstairs, two more bedrooms have their own shower room and a mezzanine can fit a sofa-bed for extra guests or provide a great reading nook. We have this model decked out in winter finery but this chalet is great for a casual year-round residence or B&B as well. Looking for other chalet or recreation home plans? 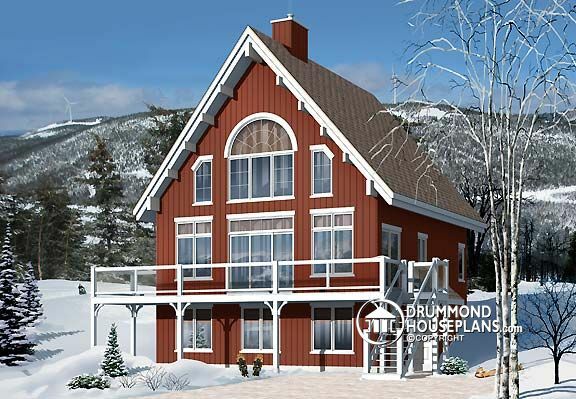 Check our Cottage and Chalet Collection, or Create a “New House Plans – Latest Trends” Alert to receive all of the latest designs direct to you by email! Glad I’ve finally found soehmting I agree with!